Akagi: the queen of the Japanese carriers. She began life as a fast battle cruiser in 1922. After the Washington Treaty, Akagi was rebuilt as a huge aircraft carrier. Akagi sported a 2 level hangar deck, and could accommodate nearly 100 aircraft. 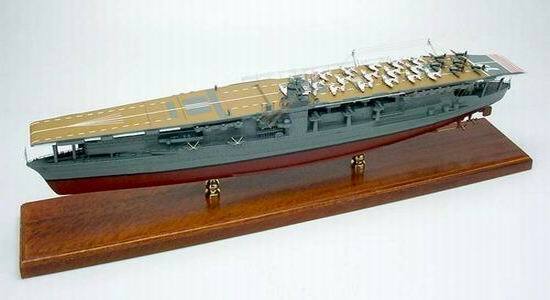 She was extensively rebuilt in the 1930's with a full length flight deck and her now famous strut supports on either end of the flight deck; now a distinctly Japanese trait. A marked ship after Pearl Harbor, Akagi participated in every carrier battle before Midway. On June 5, 1942 Akagi was destroyed when bombs stacked in the hangar decks exploded after an American attack. She sank the following day after the gasoline tanks exploded and sealed her fate. Mahogany Wood. Scale: 1/350. Length 33 1/2 inches.